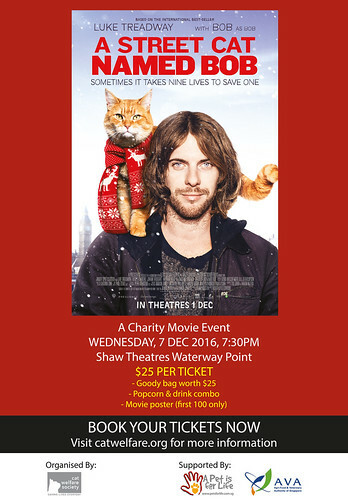 Join Cat Welfare Society for A Street Cat Named Bob on Wednesday 7 December at 7:30pm! We are filling two halls full of cat lovers at Shaw Theatres Waterway Point! Thanks to the generousity of our kind sponsors, close to 100% of ticket sales will go towards the welfare of the community cats. Be the first to catch the much anticipated British family comedy-drama film directed by Roger Spottiswoode, based on the book of same name by James Bowen. The film stars Luke Treadaway, Ruta Gedmintas, Joanne Froggatt, Anthony Head and Bob the Cat as himself. This movie event is held as part of the AVA’s Responsible Pet Ownership Roadshow from 5 – 11 December 2016 at Waterway Point in Punggol. In 2013, cat welfare grew and advanced at a rate and in a manner unlike previous years and we want to thank you for being a part of this. We hope to see you at our upcoming Annual General Meeting where we will be sharing our plans for 2014 – 2015. After the success of Spay Day, we are launching PROJECT 500 to provide free sterilisation to 500 community cats by end February 2012. Unlike Spay Day that aims to benefit all caregivers, this project is our dedication to a select team of dedicated and effective MEDIATORS around Singapore. UPDATE: 554 cats were sterilised through Project 500!